Photograph courtesy Danny Preston, collection of Neil Johnson. 25046 relatively ex-works at Polmadie, sometime during 1980. Despite this recent outshopping, the locomotive would be withdrawn early in 1981. The seventeen year nine month career of D5196/25046 saw allocations to London Midland and Scottish Region depots. The allocation history was similar to the immediately preceding locomotives. 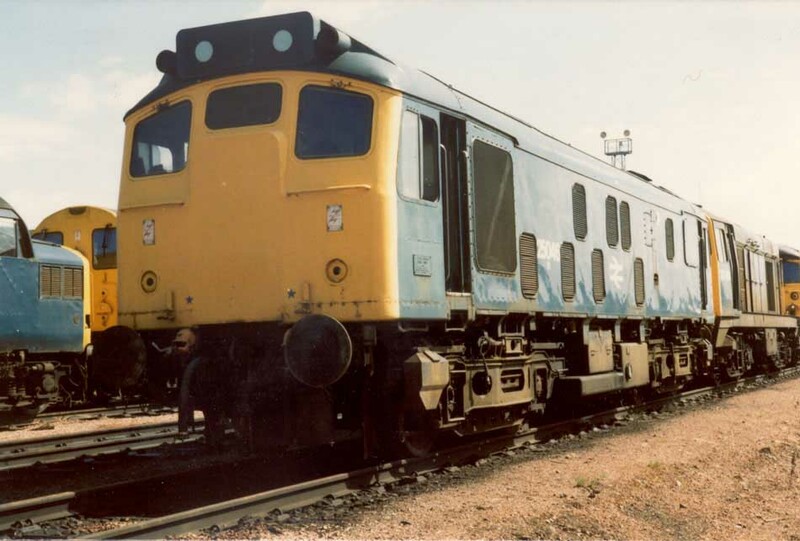 The last Class 25 to have its gangway doors sheeted over? January 1965 to London Midland (Midland) Lines LMML. 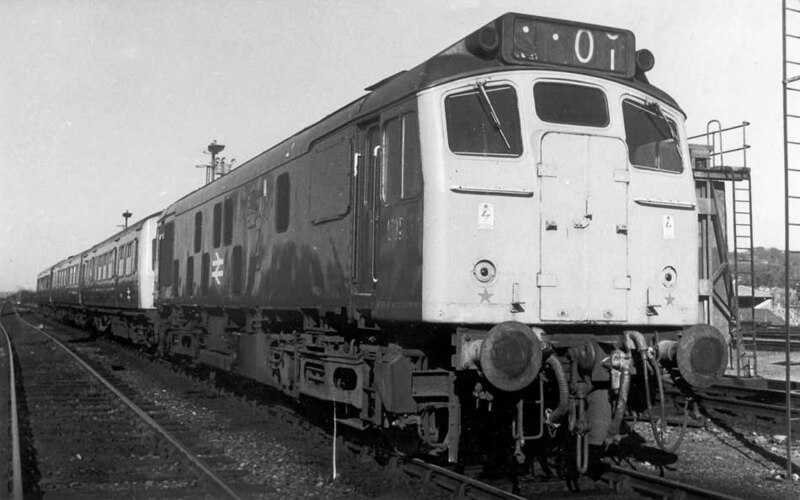 January 1966 to London Divison (Midland) (D14). June 1968 to London Midland (Midland) Lines LMML. July 1972 to Liverpool Divison. (D08). August 1976 to Springs Branch. 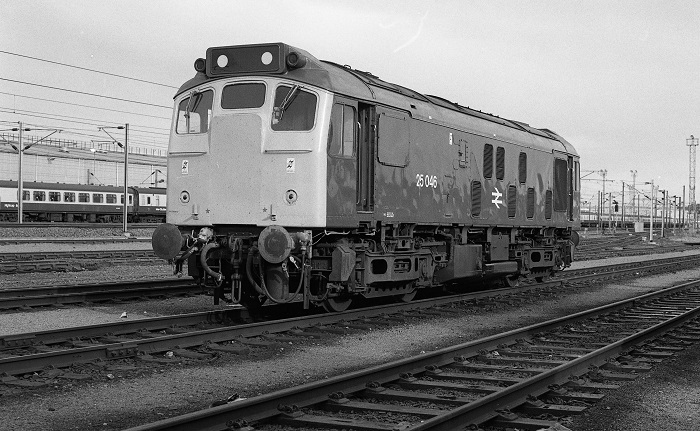 25046 was the 87th Class 25 to be withdrawn, being one of twelve Class 25s withdrawn during February 1981. After withdrawal 25046 was stored at Haymarket until June 1981, it later moved to Millerhill where it remained until late October 1981 when it was taken via Mossend to Polmadie. At Polmadie it was eventually moved to Shawfield Sidings by at least April 1983. During April 1987 25046 was sold to Vic Berry's for scrap and moved to Thornton Junction on April 29th 1987 with 25160 for scrapping. All the remaining scrap Class 25s on the Scottish Region were now located at Thornton. The discovery of asbestos in some of the locomotives at Thornton Junction curtailed scrapping here, all those remaining were gradually shipped off to Vic Berry’s Leicester Yard. On June 10th 25046, 25160 & 27016 moved to Mossend, on June 11th they journeyed to Carlisle, thus 25046 & 25160 were to be the last Class 25s on the Scottish Region. Basford Hall was reached on June 22nd and Leicester Humberstone Road on June 23rd, entering Vic Berry's yard on June 30th behind 31168. By July 10th 25046 had been broken up. Photograph courtesy A Forster. Withdrawn 25046 at Polmadie, date unknown. 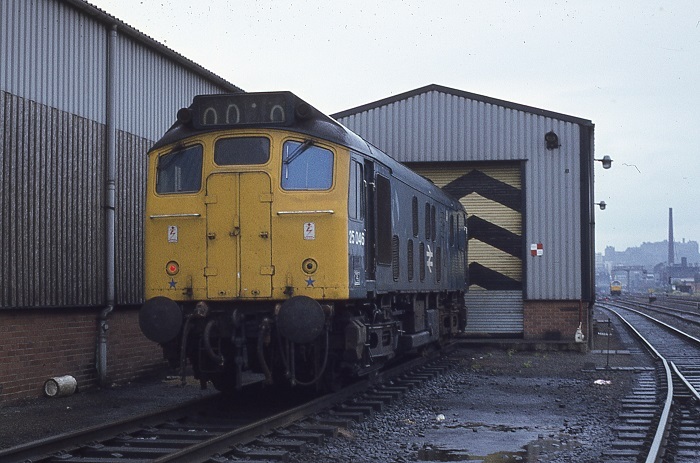 Noted Crewe Works June 1975. Noted Glasgow Works February - April 1980 (Intermediate repair, paint date 29/3/80). The frames for D5196 were laid down at Derby Works during November 1962 and completed towards the end of April 1963, initially being allocated to Toton (18A). Being boiler equipped D5196 would frequently be utilised on the area's local passenger workings. D5196 made two test runs to Corby, the first on May 2nd 1963 and the second on May 7th 1963. Condition April: green livery with small yellow warning panels, curved upper corners, warning panels covers frame level stripe. On August 24th D5196 & D5266 worked the summer dated round trip Nottingham - Llandudno Town. On November 11th 5196 worked the 09.20 Carlisle - Edinburgh and 14.55 Edinburgh - Carlisle over the Waverley route. The summer only passenger workings between Newcastle, Ayr & Stranraer continued to feature Sulzer 2’s, though the Class 25's were now more common on these workings than the Class 24's. The 23.45FO Newcastle - Stranraer and the 13.50SO return working brought utilised 5182 & 5196 on July 25th/26th. This service had seen Class 40’s in 1968, though these had not ventured beyond Ayr due to lack of driver knowledge of the Stranraer line. Loads varied between nine & twelve coaches. August 2nd proved to be a very busy day at Carlisle due to the ending of the Paisley & Kilmarnock works holidays and the beginning of the Glasgow holiday. 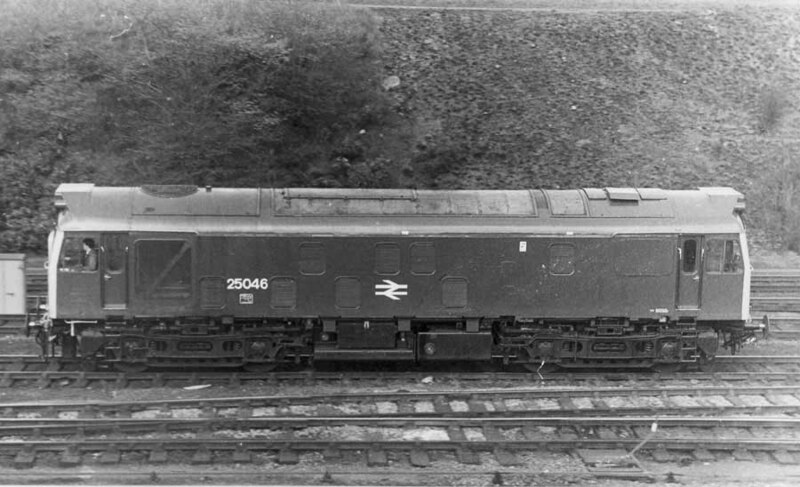 The majority of the specials ran with Peaks, Brush 4’s and EE Type 4’s. Peaks were in charge of the Glasgow trains coming off the Leeds route, because of the quantity of trains this day the locomotives were quickly turned round to take up their next workings. However the lucky passengers on the relief Morecambe - Glasgow (1Z10) had the thrill of 5259 & 5196. On August 11th 5196 worked the 20.33 Carlisle - Perth, the next night (12th) it worked the 20.30 Perth - Carstairs, a parcels train? Two days later (14th) 5196 & 7589 worked the 09.20 Manchester Piccadilly - Yarmouth to Lincoln Central, returning with the 09.28 Yarmouth - Manchester Piccadilly. The 20.43 Birmingham New Street - Peterborough was worked by 5196 on February 11th. On August 3rd 25046 & 25211 worked a roundtrip Leicester - Skegness service. On August 28th 25046 & 25116 were noted at Birmingham New Street on an unidentified passenger working. The evening Huddersfield - Wakefield parcels was worked by 25046 on January 22nd. On May 24th the 08.52 Leicester - Skegness and 12.30 Skegness - Leicester were worked by 25046 & 25210. The Pennine Venturer 3 (LCGB) railtour on January 24th was worked from Liverpool Exchange to Manchester Victoria where 25046 failed and was replaced by 25104. On May 27th 25046 made it all the way to Parkeston Quay on a freight from Whitemoor, the Class 25 returned light to Ipswich before taking another freight west. On July 3rd the 08.00 Walsall - Yarmouth was worked to Norwich by 25046 & 25075, returning from Norwich with the 14.15 Yarmouth - Derby. July 29th was probably a typical day at Nuneaton, being noted were returning empty ballast workings with 25150 from Beighton Junction, 25046 from Bordesley Junction and 25116 from Lenton, with two Class 31 hauled workings from the southern end of the Eastern Region. 25046 was transferred to Haymarket during May, this would be its last transfer. On August 20th 25046 worked the 14.44 Glasgow Queen Street - Dundee. Later that day 25046 & 25013 worked the 23.45 Inverness - Glasgow Queen Street forward from Stirling, having replaced 40006. On September 3rd the 10.45 Edinburgh - Aberdeen failed at Arbroath behind 40061, 25046 took the service on to Aberdeen. On the afternoon of September 10th 25046 was stabled at Motherwell. The 23.05 Edinburgh - Perth on October 8th was worked by 25046 & 25050. This pair were then were utilised for the Carstairs - Edinburgh - Dundee - Aberdeen leg of October 8th's (by now the 9th when the 25s took over) Wirral Railway Circle 'Spirit of the Barley' railtour which ran between Crewe - Fraserburgh. The Class 25s were not used on the return leg, 47205 ran throughout from Aberdeen to Crewe. On June 19th 25046 worked the 21.40 Edinburgh - Carstairs. Photograph courtesy Adrian Healey. On a damp July 1st 1978 25046 sits alongside the mainline at Haymarket. 25046 must have been one of the last Class 25s to retain its gangway doors, they were sheeted over during its Intermediate repair at Glasgow during 1980. Glasgow - Dundee turns were worked on August 22nd & 28th by 25046. Photograph courtesy A Forster. Another Haymarket view of 25046 on May 13th 1979, this time possibly attached to a diesel multiple unit. Its pre-TOPS number is starting to show through the cabside paintwork. On July 23rd 25046 was noted at Inverurie on an Aberdeen - Inverness passenger service. The 14.25 Edinburgh - Birmingham New Street was worked to Carstairs by 25046 & 25019 on August 12th. Condition February: blue/yellow livery, gangway doors fitted, blanking plates fitted, hand/footholds plated over, three-rung bogie mounted footsteps, straight sided sandboxes. 25046 visited Glasgow Works from February to early April for an Intermediate repair, it returned to Glasgow mid-month for rectification work. The 11.05 Perth - Edinburgh was worked by 25046 on May 20th. 25046 paid a brief visit to Glasgow Works during mid June but by the 28th was noted in charge of the 10.44 Glasgow Queen St - Dundee and the 13.33 Dundee - Glasgow Queen Street. On September 15th 25046 & 25078 were noted through Barrow in Furness with an empty coaching stock train. A month later it was at Haymarket depot with wheel and axle defects awaiting parts. During November & December it was twice noted at Inverness depot with a traction motor fault. Photograph courtesy A Forster. A fresh coat of paint reveals that 25046 has paid a visit to Glasgow Works, receiving an Intermediate repair. Seen here at Millerhill on April 28th 1980. Regrettably the overhaul did not prolong the life of 25046, within ten months of this view 25046 was withdrawn. 25046 was withdrawn on February 1st and stored at Millerhill. It was less than a year out of an Intermediate repair, so the cause for its demise must have been significant and beyond the existing cost limits. 25046 would remain here until October 2nd when it moved to Mossend, the next day moving on to Polmadie Works. After a short while in the works it was moved across to Polmadie stabling point. It seems likely that after being withdrawn 25046 underwent a bogie exchange, which presumably took place at Polmadie. When outshopped from Glasgow Works in 1980 the bogies were fitted with straight sided sandboxes and three rung bogie mounted footsteps, after storage at Polmadie it was sitting on bogies with ridge sided sandboxes and two rung bogie mounted footsteps. Condition Final (after withdrawal): blue/yellow livery, gangway doors sheeted over, center lampbracket and other fittings removed, blanking plates fitted, hand/footholds plated over, two-rung bogie mounted footsteps, ridge sided sandboxes, large numbers. Page added June 20th 2005.